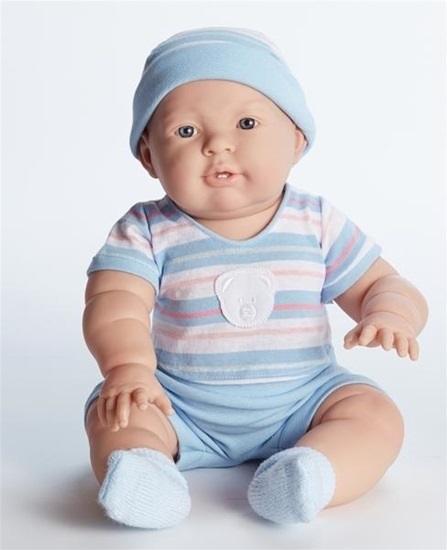 At 18 inches long, this adorable baby boy is ready to explore the world around him and have new adventures! Ready to explore the world around him and have new adventures, we introduce Lucas. Dressed in his blue Teddy Bear shirt, shorts, matching hat and booties, Lucas is ready to take on this great big world! Lucas is 18 inches tall, made of vinyl, and is anatomically correct. His arms, legs, and head moves. One look at those beautiful baby blues and expressive face, and you will fall in love! Dolls by Berenguer are well known for their superior quality as many of these dolls are made in Spain. For over 50 years Berenguer has designed dolls that have set the standard in the industry. All dolls by Berenguer are hand sculpted and design to bring joy to collectors.